VHS cover for the movie. Super Mario Bros.: Pīchi-hime Kyushutsu Dai Sakusen! (Japanese スーパー マリオ ブラザーズ ピーチ姫救出大作戦! Sūpā Mario Burazāzu Pīchi-hime Kyushutsu Dai Sakusen! ), in English, roughly Super Mario Bros.: The Great Mission to Rescue Princess Peach!, is a Mario animated film that was only released in Japan. It is a rough interpretation of the events of the original Super Mario Bros. with several alterations. Directed by Masami Hata, written by Hideo Takayashiki and produced by Masakatsu Suzuki and Tsunemasa Hatano, it was produced by Grouper Studios (in co-operation with Nintendo) and distributed by Shochiku-Fuji Company theatrically and VAP on rental-only VHS tapes. The film's running time is approximately one hour. With only a small number of copies of the film known to exist, it is considered one of the rarest Mario merchandise. It is notable for being the first film adaptation of a video game. 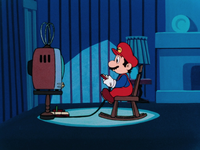 The movie opens with Mario playing a video game on a Famicom. Luigi goes to bed because it is late, but Mario continues playing the game. Suddenly, the screen changes, and the player character is replaced by a girl in a dress fighting and fleeing various Mario game enemies. In a panic, she teleports out of the television, to Mario's great surprise. After narrowly dodging a mob of enemies, she explains that she is Princess Peach and she wants Mario to protect her. King Koopa then appears on the TV screen, and Peach explains to Mario that he's quite devilish and is causing havoc on her kingdom. Mario, fast in love with the princess, promises to defend her from danger. King Koopa emerges from the television, and he and Mario have a brief confrontation. He knocks Mario through a hole in the floor and teleports back into the TV set with Peach. Before Mario could chase after him, King Koopa and Peach vanish, leaving a "Game Over" screen. Mario cries out for Peach, which awakens Luigi, who asks what's going on. Mario explains what happened, and Luigi deduces that he's just dreaming and dismisses Mario before going back to bed. Mario thinks that might be the case, but then notices an emerald pendant on the floor– the same one that the princess was wearing around her neck. He now knows what he saw was definitely real, but has no idea what he can do about it. The next day, Mario and Luigi go to work at their grocery store. Mario daydreams about Princess Peach, crying over her sudden disappearance. 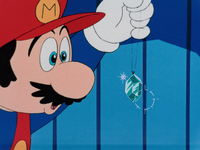 As a customer unsatisfied with Mario's absentmindedness leaves, Luigi noticed the pendant in Mario's hand, greedily recognizing it as a visionary gem that can guide the owner to the Mushroom Kingdom, a land of untold riches. They resolve to seek out the kingdom and Mario calls the author, who immediately knows Mario's name and says he'll send for him. 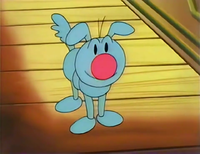 Suddenly, a strange blue dog-like creature known as Kibidango enters their store and steals the illusory jewel, causing the brothers to chase after it to a field full of pipes. Chasing the dog into the pipes, they vanish along with the pipes (which then fall down) themselves. They land in a cave, and are greeted by Kinoko Sennin, a wise old man in a white robe. He reveals himself as the writer of the book, and explains that the evil King Koopa of the Turtle Tribe has conquered the Mushroom Kingdom since Princess Peach rejected his proposal. King Koopa used his magic to turn the realm's mushroom-headed citizens into bricks and plants. Princess Peach believed in the prophecy of faraway, mustachioed, temperamental twins in attractive, colorful, rich overalls coming to her rescue, but when she sought Mario she was kidnapped by King Koopa, who plans on marrying her on Friday the 13th. Mario is furious (even putting on a Mexican bandit's outfit to show off his rage in an anime gag) and vows to defeat King Koopa and rescue Peach. The wise man tells Mario he will require the assistance of three mystical items: the mushroom, flower and star, which were scattered throughout the world by King Koopa's minions. Mario goes on ahead, with Luigi inquiring about a reward and being told that he may collect any of the many gold coins and treasures he will come across. Kibidango also accompanies the brothers, encouraged by Kinoko Sennin to keep a watchful eye on their progress, who then mysteriously vanishes as he wishes them good luck. Walking through a strange field, the team progresses, seeing various new and strange sights. Soon, they're spotted by two Goombas, who sneakily observe them from a distance. Eventually, they find a rest stop, and Mario goes to sleep. Luigi, however, is too hungry to rest, and complains about how famished he is (even thinking Kibidango would make a fine roast). 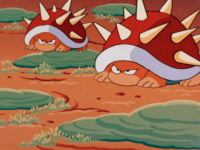 The two Goombas arrive, claiming to be mushrooms, and lead the starving Luigi to a field of strange mushrooms before departing. Mario awakes, and hears Luigi laughing hysterically due to the strange mushrooms the Goombas led him to. Luigi then accidentally eats more and starts crying. Mario figures that there are "laughing" and "crying" mushrooms, so he feeds Luigi what he thinks is a "laughing" mushroom in order to cancel out the effect - and Luigi loses his temper and punches him several times, losing control of his emotions. Suddenly, an adult Paratroopa mother picks Mario up and takes him to her nest. He throws his mushrooms at the chicks, distracting them with its weird effects. The Paratroopa then picks up Luigi and Kibidango, and Mario convinces them they they also taste bad. 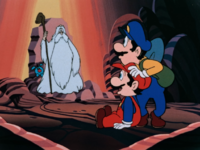 From their odd position, the brothers spot a mushroom frozen in a block of ice, which Mario believes is the one he's looking for. Mario climbs up some rocks to reach it, and in addition to getting it, uncovers a hidden rock that starts shooting out coins. The sudden surprise, however, causes Mario to lose his footing, and he falls, taking Luigi and Kibidango with him. Upon landing in the field below thanks to the chicks breaking their rapid descent, Luigi picks up one of the coins, which starts shining brightly. After a flash of light, the coins transforms into mushroom people, and a tall, soft-spoken person stands before them. 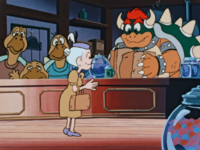 The being formally identifies himself as a close personal servant of Princess Peach known as Toad, explains that King Koopa turned them into coins, and thanks the brothers for rescuing him and his friends. The brothers are presented with the mushroom (calling it the "Super Mushroom") as thanks, and they now have one of the three powerful items. Behind them, the freed citizens wave their goodbyes - even the Paratroopas, who had grown affectionate towards the rag-tag team. They continue walking onward, meeting challenges such as Bullet Bills and a giant Koopa Troopa, which Mario uses his mushroom's powers to fight against. Finally, they reach a fork in the road. The two Goombas appear again from atop a giant boot. Mario asks for the best path to head eastward, and is recommended about the garden course. While it looks peaceful at it, it turns out to be a field of Piranha Plants. Once the plants start attacking, the three struggle to escape, narrowly dodging the attacking flowers. Behind them, the plants tangle themselves together, and they all tumble down. When they finally do manage to escape, they run into an even greater danger. Lakitu looms overhead, angered that they teased his so-called delicate flowers, and throws several Spiny Eggs at them. They remain in spiked ball form on the ground, and the brothers laugh at how he "missed" hitting them. Lakitu then pulls a lever on his cloud, thundering rain and sun on them to cause them to grow into full-grown Spinies, which begin to surround Mario, Luigi, and Kibidango. Luckily, a beanstalk sprouts under Mario, lifting the three into the air along with it as the Spinies collide. Lakitu thinks he's defeated them for a moment and is pleased to feed them to his plants, but in a delayed reaction flees from Mario, who grabs on to his cloud and manages to tear off a piece before Lakitu escapes into the sky. Mario fiddles with the controls to save Luigi and Kibidango, causing various weather effects, and finally gets it to snow, causing the Spinies to hibernate and the cloud piece to disappear. When the snow clears, the Spinies are nowhere to be seen. A fluff of cloud turns into another Toad subject, who rewards Mario with the flower. They continue walking along, meeting more enemies which Mario defeats with his flower (including what appear to be huge Buzzy Beetles, which couldn't be defeated with fireballs in the game). Luigi hits a block and gets a bunch of coins. Mario hits another block, causing a bunch of ramen boxes (labeled with the brothers' faces) to pop out. Excited at seeing food for the first time in awhile, the two take a quick lunch break. 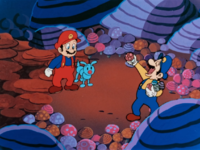 Luigi eventually leads the three on a trail of gold coins leading up to an enriched cave which they don't find suspicious in the least, much to Kibidango's chagrin. Once inside, rocks fall and block the exit. The Goombas arrive on the other side of a barred window and taunt them, explaining that entrance into the gold mine is a crime. Mario asks for forgiveness and tells them that he has to save Princess Peach, but the Goomba tell him that the wedding is tonight and that they expect King Koopa to reward them for putting a stop to the brothers' quest. They leave them at this point, and a lone Hammer Bro guards the exit to prevent their escape. Bowser having transformed into a scarecrow to amuse Princess Peach. Meanwhile at the castle, Peach sadly waits on the balcony. King Koopa enters the scene, asking what wedding dress she'd prefer and trying to convince Peach to love him. Peach sees this as an opportunity and tries to trick him, saying that she'd like King Koopa to transform for her amusement. King Koopa uses his magic to turn into a bizarre scarecrow and a dancer, which Peach says are beautiful. Then she tells him to transform into something petite and cute like a teddy bear, so he finally appeases her by becoming one. Peach picks him up and locks him in a box, thinking she's succeeded in defeating King Koopa. However, King Koopa reverts into his normal form from the box itself, laughing at Peach for thinking it would be that easy to defeat him. 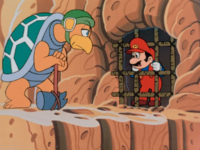 After gloating at her with the news he heard that Mario had been captured by one of his troops, King Koopa exits the room locking the door behind him leaving Peach captive in her tower. Back in the cave, Mario leans against the bars and has a brief daydream in which he (dressed in a suit) dances with Peach in a garden. Luigi interrupts this by digging through the floor, explaining that he's found a way to escape. Kibidango tries to snap Mario out of it, but Mario turns his head and sleepily kisses the unamused Hammer Bro. They quickly leave, initiating a brief chase with the agitated Hammer Bro. Once they get away, Luigi sees that the gold he got from the cave was fake and angrily throws it into the nearby body of water. Mario notices that among the fake coins was the star, which also falls into the water. He and Kibidango quickly jumps in after it, with Luigi splashing and exclaiming that he can't swim. Underwater, they get threatened by an angler fish and attacked a large flat fish, which puffs into a large Cheep Cheep before forcefully splitting into multiple smaller ones, and finally find the star in a big clam. Mario and Kibidango try distracting the clam to open it up, but it closes down on Mario. 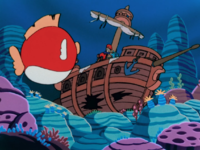 Kibidango manages to get Mario and the star out of there, and they escape from another pursuing fish by going to an old sunken ship. Like the other fish, it explodes into multiple copies when it rams the ship, but for the moment they are safe. The ship begins to move to the surface, revealing an enormous Blooper underneath that tries to pull it back down. Mario and Kibidango frantically blow on the sail to steer the ship upwards and shakes off the Blooper. They escape the waters in the floating ship and reunites with Luigi (who was sitting under a palm tree on a tiny island). Now having all the three items, they proceed to King Koopa's castle. Along the way, Mario attempts to forcibly speed up their ship, only to cause them to lose control and spin out multiple times. When they spot it against the moonlight, Mario remarks that he thought it was supposed to be a full moon tonight, so it inflates into a round blood-red moon to spite him. Back at the castle, King Koopa has his wedding ceremony planned, much to Peach's distress. Shisai begins the ceremony and King Koopa waits with bated breath over Peach's "I do", and she finally says she's happy and that she feels like she was waiting forever for this moment. 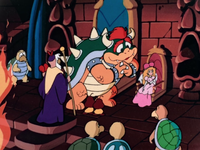 King Koopa thinks that she's giving her oath, but looks in the direction Peach is gazing and spots the heroes rowing the floating ship outside. It soon crumbles onto the cannon that was being readied, taking it out. King Koopa yells at the Goombas and grabs Peach, telling Shisai that they'll continue the wedding uninterrupted in the next room. The room seals behind them, so Mario, Luigi and Kibidango hurry to find a way around. Mario and Kibidango go through a hole in the wall and catch a glimpse of King Koopa, so they give chase as they dodge a vanishing row of flames and Luigi digs for more treasure. After moving through some gears, the two arrive in a chamber with a lava pit and a few doors on the other side. The two Goombas rest on a control panel, explaining that in order to pass the area, Mario must jump across dangerous elevator platforms. They pull a stick (with their arm) on the mechanism they're sitting on, and rising fireball obstacles are added to the mix. Mario is almost burned as things heat up, but Luigi, who was mining for more coins, accidentally causes a water leak in one of the walls, which flushes him out and floods the entire chamber. While this stops the moving platforms, Mario expresses worry for his fallen brother - who is comically shown to be relaxing in the steaming liquid as a hot spring. The castle starts to collapse due to the flooding, which is observed in the private room where King Koopa is presenting his oversized ring to Peach in front of Shisai. Mario and Kibidango see Peach pushing some rubble over her, but King Koopa also rises from the wreckage and grasps Peach, initiating the climactic battle. Mario doesn't stand a chance against King Koopa's strength and firepower, but Kibidango barks at him, somehow reminding him to use the power-ups. Mario eats the mushroom and flower, but drops the star when he becomes distracted by another meal, sending it falling into a hole in the ground. Mario is tossed around and King Koopa announces that he will ultimately take down Mario with his next move, but Peach begs King Koopa to stop and tells him that she'll do anything if he spares Mario's life - even willingly marry him. This makes King Koopa slow down and ponder, but he replies that Mario already ate the mushroom and flower, so he has to put an end to the hero before he takes the star someday and overthrows his reign. At the same time, Luigi digs up through the ground, wondering why Mario's laying down on the job as his brother tells him to hurry up and return his star. King Koopa seemingly squishes the heroes, but Mario rises from under his foot and begins pummeling King Koopa with his newfound invincibility, finally grabbing him by the tail and throwing him into the horizon. King Koopa is seen waving a white flag on a parachute from far away. With King Koopa's evil magic broken, the light of dawn pierces the dark landscape, turning it into a lush green field and restoring the ruins of the castle into Peach's castle. Mario returns Peach's pendant, which Peach says is a sentimental Brooch she has had her entire life, and she kisses him on the nose. She puts it on while reciting a legend that she will meet an upstanding prince one day who wears the same thing. When Mario declares that he will find the matching half, Kibidango reacts to it and is turned into a human. He is wearing the Brooch's twin, and reveals himself to be Haru, a prince of a neighboring land known as Flower-koku. He came to the Mushroom Kingdom to find the person who wore his matching half, but was cursed by King Koopa's spell. Heartbroken upon hearing this connection to Princess Peach, Mario nearly faints out of exasperation. 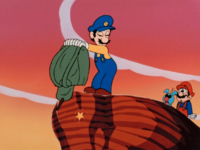 However, Peach thanks Mario and Luigi for saving them, and the two heroes go home after promising that they'd gladly come back to the rescue if their services are ever needed. After they leave, Kinoko Sennin reappears and offers his musings on the plucky heroes to the recent royal couple. Mario and Luigi travels a long way home as the credits roll, and the movie ends with a scene in the grocery, where King Koopa and three other members of the Turtle Tribe now work as employees of Mario and Luigi's store as "Game Over" appears on the screen. The soundtrack was produced in very limited quantity with only 50 copies. Both a 12" LP vinyl record and a 7" 45 RPM single were produced. The 7" featured two variations of "Doki Doki Do it! ", whilst the 12" LP featured the entire film soundtrack. Also packaged in with the LP was a picture book titled "Mario's Fantastic World PICTURE BOOK". The book consists of lyrics, director interviews and promotional art. It was not included with the 7" 45, as it was instead bundled with a much smaller book featuring lyrics. Songs were produced by both Mami Yamase (voice of Peach, who was also a relatively famous pop singer at the time), and another famous Japanese band. The record was produced by King Records. Peach-hime Kyushutsu Dai Sakusen! was a production of Grouper Studios as a tie-in to the Japanese version of Super Mario Bros. 2 (later known as Super Mario Bros: The Lost Levels). The mushrooms that cause ill effects in the film may even be a reference to the Poison Mushroom. It is believed that a song in the movie went unused (VS. Super Mario Bros. name selection); however, this is incorrect. It is heard at the scene when Luigi is eating mushrooms. The film was released theatrically on July 20, 1986, and screened exclusively at Sochiku theaters, where it was shown as part of a double feature alongside a video guide for Lost Levels. 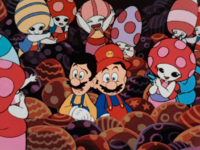 A few commercials done by the same animation company and cast were done for tie-in merchandise for Mario-brand Furikake (rice topping) watches, cameras and phone cards, and there were two instances of product placement in the film itself. One scene shows Mario hitting a block and Mario-brand ramen noodles come out. The brothers even break the fourth wall, as Luigi says it's delicious and Mario winks at the camera. Later, right before Mario can use the star, he gets distracted by Mario-brand furikake. Mario is also shown playing a Family Computer in the beginning of the film. The VHS release was distributed by VAP Video sometime after its theatrical release. However, the movie has never been republished since then, not even in newer home video formats such as DVD or Blu-ray, causing the official VHS tapes to become sought-after collector's items, with prices reaching as high as US$600 on auction sites. Moreover, the movie has never released internationally, remaining a rare production that has never been released outside Japan or in any language besides Japanese. This is because Toei Company, the company that distributed this film, does not operate outside Japan. In addition to the aforementioned merchandise, there was much more merchandise produced based on the film, all of which are rare. The following are photos of all the Mario anime merchandise. A height chart featuring the various characters in the film. Various merchandise and furikake are shown in the art book. This is one of the first instances in any media Luigi is depicted taller than Mario, something that would not be accentuated worldwide until the release of the western Super Mario Bros. 2. On a similar note, it is also one of the first instances to depict Peach as being taller than Mario by default, as while the first Super Mario Bros. does depict her as being taller than Mario in his small form, it at the same time depicted her as being shorter than his super form (with the Deluxe port indicating the height difference was sufficient enough that she has to stand on her tip-toes to kiss Mario's face), and like Luigi would not be accentuated worldwide until the release of the western Super Mario Bros. 2. 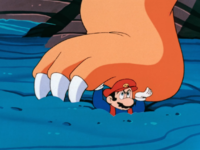 At one point, Mario temporarily grows giant by using a Super Mushroom. Super Mushroom wouldn't have such effect in the games until Super Mario 64 DS. Later games changed this by incorporating the Mega Mushroom, beginning with New Super Mario Bros.. This is the first media where Bowser is known to have a romantic interest on Peach which is something that wouldn't be shown in the games until Paper Mario. 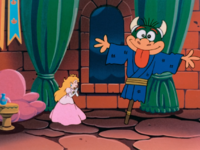 This is also the first Mario media in which Bowser ever tries to initiate a marriage between him and Peach which is something that would happen in the Do You Princess Toadstool Take This Koopa...? episode of the Super Mario Bros. Super Show, the Super Mario Adventures comic, and more recently the plot for Super Mario Odyssey (Super Paper Mario doesn't count, as while Bowser and Peach do enter a marriage in that game, Count Bleck is the one who initiated the marriage in that case instead of Bowser). Larger counterparts of enemies from the games appear in this film. Giant enemies would later appear in Super Mario Bros. 3. At one point, the two Goomba characters are seen atop a giant shoe. Though maybe a coincidence, this looks similar to the Goomba's Shoe from Super Mario Bros. 3. Mario controls a part of Lakitu's Cloud, which vanishes when it's had its use. This concept was later seen in the games beginning with Super Mario World. This is the first appearance of a ship that sails the skies, although later appearances show such vehicles in the hands of the Koopa Troop. Mario's method of battling Bowser — picking him up by the tail and throwing him — was seen much later in Super Mario 64. Also, Peach rewards Mario in the film by kissing him on the nose, something that also happens in Super Mario 64, and to a certain extent in Super Mario Bros. Deluxe (the latter only if the player beats the game in Small Form). Luigi's blue hat, yellow shirt and blue overalls bears a strong resemblance to an alternate costume for the him in Super Smash Bros. for Nintendo 3DS / Wii U. Whether this is was meant to be intentional or not has not be confirmed. During the climax for the anime, Bowser transforms Peach's castle into his citadel before the final battle, which would later be repeated in New Super Mario Bros. U. Peach having an already-betrothed fiancée as well as the main antagonist being involved in his being cursed resembles the book adaptation of Luigi's adventure in Paper Mario: The Thousand Year Door, although the primary difference is that the Chestnut King, the betrothed, acted as the false main antagonist while Prince Haru constantly acted as the Mario Bros.' ally. Peach's necklace being important for accessing the Mushroom Kingdom (which is heavily implied to be a separate realm from the real world), as well as it being tied to her, was similar to a major plot point from the Super Mario Bros. live-action movie, involving Princess Daisy's meteorite shard and it being required to merge dimensions between Earth and Dinohatten. Coincidentally, both films also featured a failed romance between a princess and one of the brothers due to outside factors beyond their control (Peach and Mario in the anime, Daisy and Luigi in the live action film). The cover artwork has some deviant character designs, notably Haru, the Mushroom People, and Luigi's shirt being red instead of yellow, which makes his outfit resemble Mario's outfit from Mario Bros. arcade. Mario demonstrates the fire flower power-up by defeating Buzzy Beetles with fireballs, but they are immune to fire in the games. When Mario is seeing Luigi laughing because of the "laughing" mushrooms, in one frame, Luigi's hair is not painted. During the scene where Mario and Luigi look up while in the Koopa Paratroopa nest, their colors have switched. When Mario gives Peach's necklace back, the brooch on her dress is absent. This is one of the few animated works to show Princess Peach with blonde hair (reflecting her concept art and her current appearance). The Super Mario Bros. Super Show! 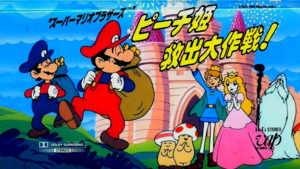 and other related cartoon shows by DIC Entertainment depicted Princess Toadstool as a redhead, like how she appeared in the original game due to the NES/Famicom only being able to handle four colors (counting transparency) per sprite due to the Picture Processing Unit (PPU)'s limitation. As noted above, this is one of the earliest mediums to have Bowser enter a forced marriage to Peach (either orchestrating it or simply participating in it in the case of Super Paper Mario). Unlike the other times, however, neither Peach nor Bowser wore wedding garments during this time. This page was last edited on December 19, 2018, at 12:47.